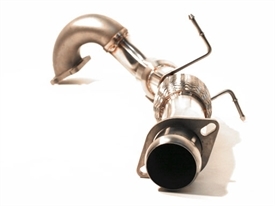 Custom Performance Engineering is very pleased to announce the release of our 3” downpipe for the new 2010 MazdaSPEED3! Our SPEED3 Gen2 downpipe replaces the choked factory pipe and its two restrictive cats, with one high-flow cat and a 3” mandrel bend pipe. The catalytic converter features a high-flow, all metallic honeycomb design, making it one of the most durable converters on the market. The result of our efforts is reduced backpressure, decreased turbo spool time, increased horsepower and a more aggressive sound. For an even greater dose of the same great sound and power, option out the catalytic converter, this is for OFF-ROAD USE ONLY.